If you are on an Prolific Works Plus or Pro account, you have the ability to add subscribers to your mailing list. You can view and download those subscribers directly on your Prolific Works account. Click on "View Subscribers" in the Secondary Navbar. 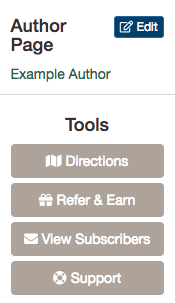 Or, click on the "View Subscribers" button on your dashboard. You will now be able to view a list of your subscribers. You can export this list as a CSV by clicking the "Export as CSV" button on the top right corner of your screen. Select the book associated with the giveaway that you wish to view. Below the URL for your giveaway, press the "View Subscribers" button.